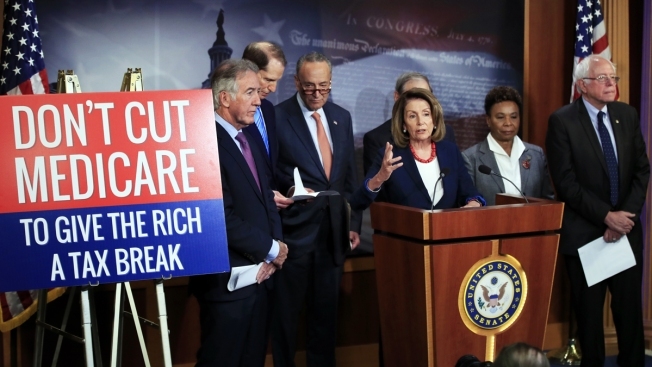 This Oct. 4, 2017, file photo shows congressional Democrats urge Republicans to abandon cuts to Medicare and Medicaid during a news conference on Capitol Hill in Washington. A new report showing that the $2 trillion in Bush- and Trump-era tax cuts match how much Republicans have proposed cutting from programs like Medicare and Social Security could give Democrats a boost before the midterms, NBC News reported. Congressional Democrats issued the report late last week. It's based on calculations by the nonprofit Institute on Taxation and Economic Policy, which is nonpartisan but aligned with a group that's criticized tax cuts for decades. "It is a dollar-for-dollar transfer of benefits to those who need help the least paid for by those who need help the most," said Phil Schiliro, who served as President Barack Obama's legislative director. The report found that the average beneficiary of social safety net programs could lose $1,500 a year under proposed cuts. Obama is one of the politicians warning voters that Republicans want to cut such programs. Republicans on the House Budget Committee responded by saying that "responsible reforms" would save the programs amid a funding crisis.